Posted on May 31, 2009 by Rohit.. The Quiz Foundation of India (Chennai Chapter), in association with Indian Terrain is proud to announce ‘The QFI Open Quiz 2009′, the fifth edition of the annual open quiz, which has become a fixture on the Chennai quizzing calendar. Research Team: Sreeram, Vijay Sarathy, Vinod Ganesh, Krishnamurti Ganesh, Vikram Rajan, Sivakumar V.V. Timings: Prelims – 10:30 a.m. and Finals – 11:30 a.m.
Timings: Prelims – 03:30 p.m. and Finals – 05:00 p.m.
Posted on May 26, 2009 by Rohit..
Posted on May 18, 2009 by Rohit..
Posted on May 17, 2009 by Rohit..
KQA will hold the fifth edition of Mahaquizzer on Sunday, 24 May 2009. The cities where centres are being offered are Bangalore, Chennai, Hyderabad, Thiruvananthapuram, Mumbai, New Delhi, Kolkata, Pune, Bhubaneshwar, Guwahati, Thrissur, Mysore and Panaji. Some quizzers in Singapore will also attempt the quiz. Mahaquizzer is the National Quizzing Championship. It is open to single entrants. There is no entry fee. Contestants are required to answer 150 questions over 90 minutes. 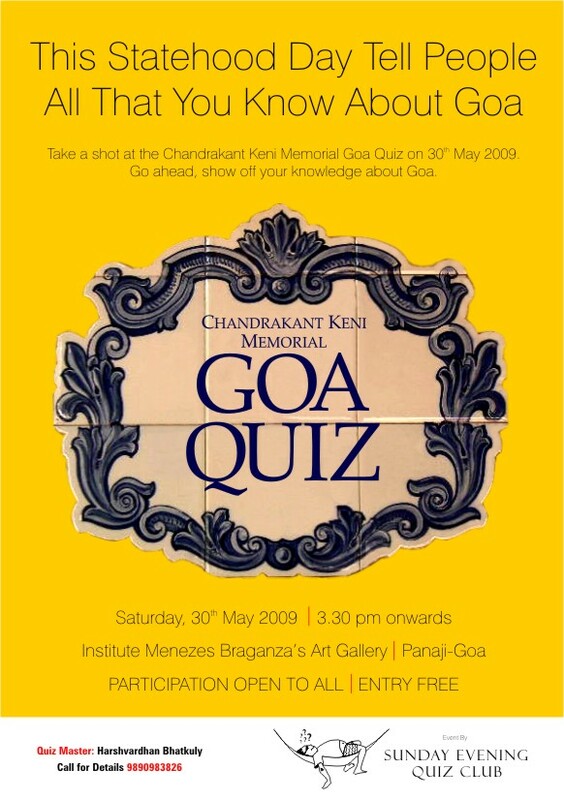 Mahaquizzer 2009 has been set by Arun Hiregange, Dibyendu Das, Thejaswi Udupa, Avinash Thirumalai and Ochintya Sharma. Four prizes will be given out in each city: Best Quizzer, Best Woman Quizzer, Best College Quizzer and Best School Quizzer. The person recording the highest score across all centres will hold the title of Mahaquizzer for 2009. She/he will also be awarded the Wing Commander G.R. Mulky Trophy for Quizzing Excellence.This trophy will be given in June 2009 during the KQA 26th Anniversary event. Participants interested in registering should mail Mahaquizzer@gmail.com. Please mention the city where you would like to appear from in the subject-header. Please do mention age and institutional affiliations if you are a student. Since seating is limited in many centres, local coordinators will work on a first-come first-served basis. Please register by Sunday 17 May 2009 to avoid disappointment. Posted on May 12, 2009 by Rohit..
Accenture Delhi represented by Rohan Khanna & Sandeepan Chaudhuri demolished competition at the BEQ ’09 National Final. “This team was in a different league altogether. They demolished competition in Delhi, and in the history of 19 years of Brand Equity, are the first team to score 100-plus in the finals,” praised QM Derek. The winning team wins a muscular Scorpio each and loads of other prizes. Mobile Monday (MoMo) Bangalore with support from NSRCEL is happy to present MQuiz, a quiz event focused on the telecom & wireless industry at 10:30 AM on Saturday, May 23, 2009 at the IIM Bangalore Auditorium. Show off your knowledge about the mobile and communications world and battle with other teams to win cool Nokia 5800 phones (sponsored by Forum Nokia Calling All Innovator Contest ) and other prizes. Exciting audience prizes are to be won too. Content and hosting for the event is by Team Nexus. Contact Venky on +919845719332 or Vivek on +919845079348 for queries.